Like Petunia, Marygold is located on the first floor of “La Petite Maison”. 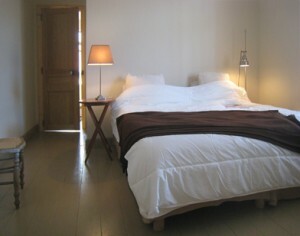 The bedroom is around 15m2 with wooden floors and private bathroom. The bathroom paved with tiny squares of mosaic has a shower, sink with mirror and a built-n-toilet. occupies the room. Again we have tried to use nice materials and natural colors to ensure maximum serinity for our guests.